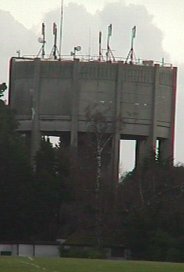 The Water Tower was constructed in 1954, and has a capacity of 2.27 Megalitres and the water level above lies at 123.4 metres above sea level. The reservoir is 3.39 metres deep and has a capacity of 2.73 megalitres. Click on the arrow to go back to The Downs.